Been listening to this show for so long now--cannot believe I haven't written a glowing review yet. Simply fantastic, it's thought-provoking and well-researched. And hey-Roman's got a perfect radio voice! My favorite parts of every episode is when Roman is so delighted by what is being said he laughs. It is so clear he gets enjoyment out of what he is doing. It can’t be anything but contagious. Just great to have the mind stimulated with your podcast. I feel like this show used to be good, the episodes were quite short and I could listen to them anytime. But now that they’re forty five minutes long, it’s just not like I can listen to them on my bike ride. He also puts episodes of other shows into his show with NO warning. And some of the narrators just sound boring or bad. I think he needs to go back a year. Over all the old ones are great and I’m still subscribed, but I don’t listen to his show much and I feel at this point it’s almost a dull bedtimes story, cause I fall asleep to it each night now. Just recently discovered 99% Invisible and I am over the moon. Compelling, interesting, profound, funny. I feel as if I’ve hit the podcast jackpot. I recommend it to everyone. I’ve learned so much. It is so refreshing to listen to topics of real interest that are not partisan. I enjoy good social political debate just like anyone but sometimes I need a break from the vitriolic divide. I crochet and listen for hours. Thank you for the appealing content, thoughtful detail, careful research, and for situating the adverts at the end. I adore Roman and the whole gang. You’ve gained a listener for life! I’ve only listened to a couple thus far, but I love it. Sometimes it seems to drone on, but the information is so wonderful! There’s nothing I could say here everyone doesn’t already know. The flagship project of Radiotopia, this is the top of the podcast game and it almost never fails to entertain and interest. Also Avery Trufelman’s voice is my celebrity crush. 99pi is ALWAYS always the first podcast I recommend to people! It has such a wealth of knowledge, always extremely well-researched and intriguing. I’ve listened to it so much that anything Roman Mars laughs at I immediately consider funny. ... you get a charitable three. Stop polluting your once-excellent podcast with clueless idiots as with Zig Zag. I know, I know, they’ve joined the Radiotopia umbrella. But, wow, you’ll want to rethink that one. Here’s hoping you can return to a solid 5-star rating. I’m rooting for you, Roman! Oof. Take your two. Avery Trufelman is just. So. Bad. Roman, you’re allowing 99PI to be a reflecting-pool for the worst kind of navel-gazers. You do you, but if this is you, I’m thoroughly-disinterested. Gone are the days of interesting podcasts from you. Didn’t know much about the tomb of the unknown soldier before the podcast. This story was gripping and unbelievable. Even after it was over, I enjoyed the conversation between the producer and host about the guards and their precision. Great episode. Love this podcast! Lots of varied topics with an approach that speaks to the curiosity in all of us, which often has me saying, “Oh yeah! I’ve always wondered about that.” I’ve not been disappointed yet. Presentation is always super clear, mic levels are perfect, and can I just give your team a gold star for good enunciation? I seriously would. Thanks for a great show. Just amazing. I learn new things each episode. Also it is great for the family. My 10 year old son is an avid fan. Always asks for the new episode! Always interesting. Casts light on a variety of subjects. I take less for granted now, because I feel like I can better see the story behind the institutions and items we hold dear. 99PI is my favorite podcast and I’m absolutely thrilled every time I see a new episode. Absolutely Brilliant, and frequently funny. Roman mars has worked tirelessly for many years to share his observations about design, Architecture, and how we interact with our environment and every day objects. His frustrations can frequently be humorous but also insightful and a delight to listen to. I’m a big fan and an ardent listener along with being an architect professionally. Keep at it Roman, you’re an inspiration. Thanks to the whole team at radiotopia. There’s always a new look here on something I’ve taken for granted or something I never knew about. There’s so much design in the world and it really makes me think and be more conscious when I get to learn about it here. This is my favorite podcast! I love leaning about all the hidden ways design influences our lives, and this podcast always has something interesting to discuss! Also Roman Mars has one of the BEST radio voices ever! There’s this one narrator that sounds terrible to listen to. I don’t know their name, but it sounds like someone with a voice modification. It’s fine for a bit but I had to stop when I noticed it on other episodes. I stumbled upon this podcast (which was also my very first) when I was in a dark period of my life, and it breathed so much wonder and hope into me that it literally saved me. It became a ritual after work - make tea, play the podcast, and create - and those special times became the highlight of my days. Roman’s voice transported me to a beautiful world of arts and science and history in a way that was almost magical, and it still does to this day. I’ve listened to every episode, and still go back to hear my favorites, and each time fills me with that same wonder and hope even though I’m in a much better place now. I can’t thank Roman and the team enough for bringing so much dedication and passion to the world, and I eagerly await each new episode. 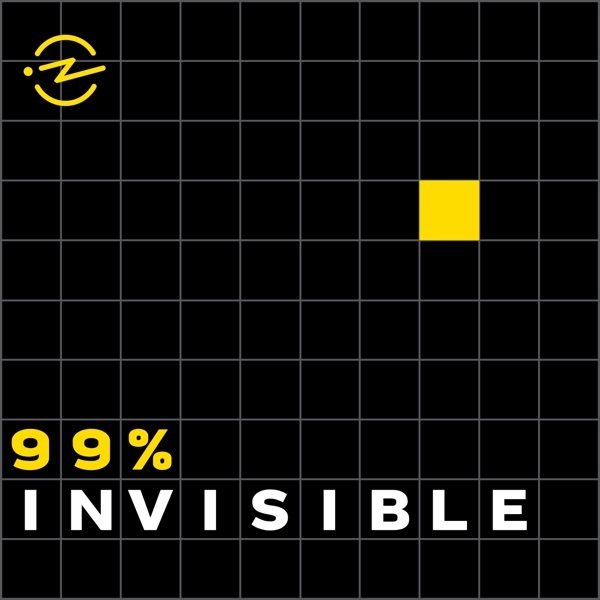 I listen to a lot of podcasts and I think 99% Invisible has the most consistently fascinating content of any of them. If you have even passing interest in art, architecture or design, you'll certainly find engaging stories here. I have tried a lot of podcasts. This one is hands down the best. Start off with an wide range of unique and riveting topics, add in extensive research and incredible writing and very high production quality and what must be the best staff on air and then top it off with the genius direction and leadership of Roman Mars and that’s what you get. A great way to spend 30 minutes in my car. A wonderful insightful review of things important and some things are cane but always interesting. And it’s fun, i.e. not didactic or polemic, no matter where you are on the political spectrum. But I refuse to go before giving this show a 5-star review. It makes my brain better. It is my happy place. I have become a podcast junkie, and 99% invisible is one of the first ones that got me hooked. And it keeps me hooked. I so appreciate Roman and team’s unique take on such a wide variety of things. In a world with so much gloom and doom, 99PI offers a respite that has both light and weight, a tough combination to achieve. This podcast helped me learn so many interesting things about stuff I had no idea could ever be interesting. This is, minute for minute, the best podcast ever produced. It’s like the old school TED talks: in 15 minutes, they forever change the way you see some part of the world. Roman’s voice is very soothing and calming. The subject matter, however mundane it may seem at first glance, is always interesting and informative. We don’t need anymore podcast about victims. Talk about design. Old episodes are great. Learned so much. You are trending towards being unlistenable. We listen to this while cooking dinner. Every episode is on a different topic over a variety of subjects, so it's our little slice of culture and learning for the day. The voices and stories are a rapturous pleasure. If you get through all the ads, the voices are very annoying. The episodes and stories are slow and dumbed down. Start from the beginning ! Very interesting mini stories, great bitesize eps early on! This is hands-down the best podcast that exists. Even when I look at the podcast episode a summary and think that I won’t enjoy the episode I end up absolutely loving it. Roman Mars finds a way to make you interested in everything. 99% Invisible is nothing short of weekly masterpieces of storytelling, design and culture all wrapped up by the soothing sounds of Roman Mars. For some reason this podcast crashes the audio system in my car. Every. Time. Always look forward to listening and learning something new, thanks Roman! This is by far my favorite podcast. Exceptional production and content. Ever since YT served me Roman’s TED talk about state flags, I have been a fan of 99pi. The team does a great job looking into how things are designed and why, often things I’d never thought about. It has led me to several other great podcasts as well, even though not every show they suggest is to my taste. I feel like 99pi has evolved to include more “issues,” maybe because it ran through a lot of the most obvious things in the build world around to explain in the first few seasons. Those early episodes that focused on physical aspects of the built environment are my favorites. But I also like what it’s evolved into at this point, almost 99 percent of the time. PS: The website rocks, too!